Nothing beats idly with chutney as a breakfast. Since Idly is a common recipe, I have not provided the video of it. 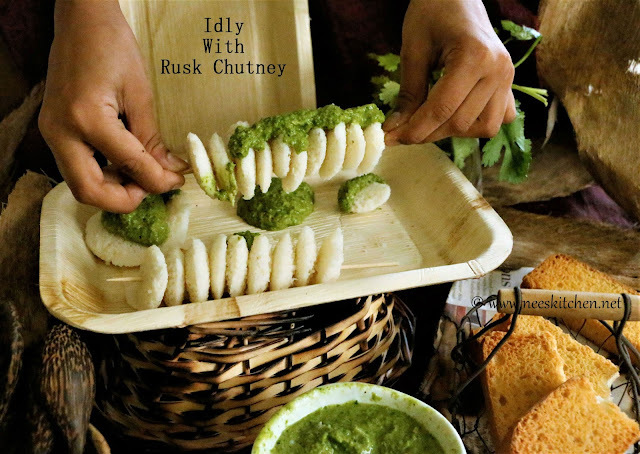 However rusk chutney is something new and we enjoy always. You can check out the video in this post below. The properties used in this photo are sponsored by “Pattra Dinnerware”. Global warming has become the buzzword in the last decade and we believe that by providing sustainable natural products like Pattra’s 100% biodegradable dinnerware we provide a tangible way of transforming our unsustainable culture. The concept of Pattra is our way of making a difference to the planet by producing environment-friendly dinnerware. The natural disposable eco-friendly, biodegradable areca palm leaf plates, bowls and serving dishes are made purely from dried fallen palm leaves and water. They are microwave and oven safe. They are single use disposable products. I am very happy that I am a small contributor to there mission by showcasing there products in my photographs. More to come !! !